The name Seahan is said to come from ‘Suíochán’. On the Down Survey map of 1655 and on Rocque’s map of 1760, the mountain is called “Seavick na Bantree”, an anglicisation that suggests the translation ‘Seat (Suí) of the Widow’s Son’. The word “Suí” in one combination or another keeps coming up in other hilltop names in this area as well (Seefin, Seefingan), and it clearly refers in each case to the large megalithic tombs on those mountains. If we remember that the old Fenian Cycle in Irish literature situates some of the heroic feats of Finn MacCool and the Fianna in nearby Glenasmole and the hills around, I think it’s easy to understand how the popular imagination would see in these giant ‘seats’ the haunts of our Celtic supermen. Seefin (Suí Finn), just 3.5 kms to the south of Seahan, makes the association explicit. 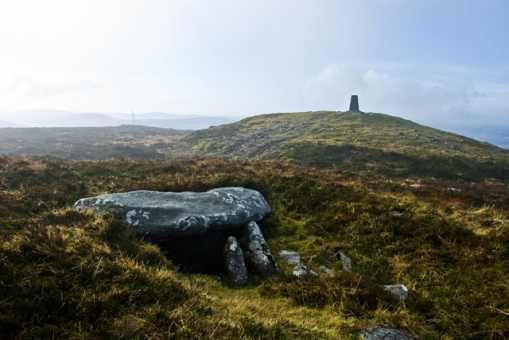 There are no less than three megalithic tombs on Seahan. The cairn to the east is a passage tomb, over 21m in diameter, with a kerb of elongated granite stones. On top of the cairn can be seen the capstone (visible in the photo) over the central chamber. The second cairn, now topped with a trig pillar, is almost 24m in diameter and 2m high. It appears never to have been opened. A short distance further west lie the shattered remains of a wedge tomb – a kind of burial that is considered unusual above 300m.